Works with anything from lacquer to latex, with minimal overspray—features Earlex® HVLP technology. 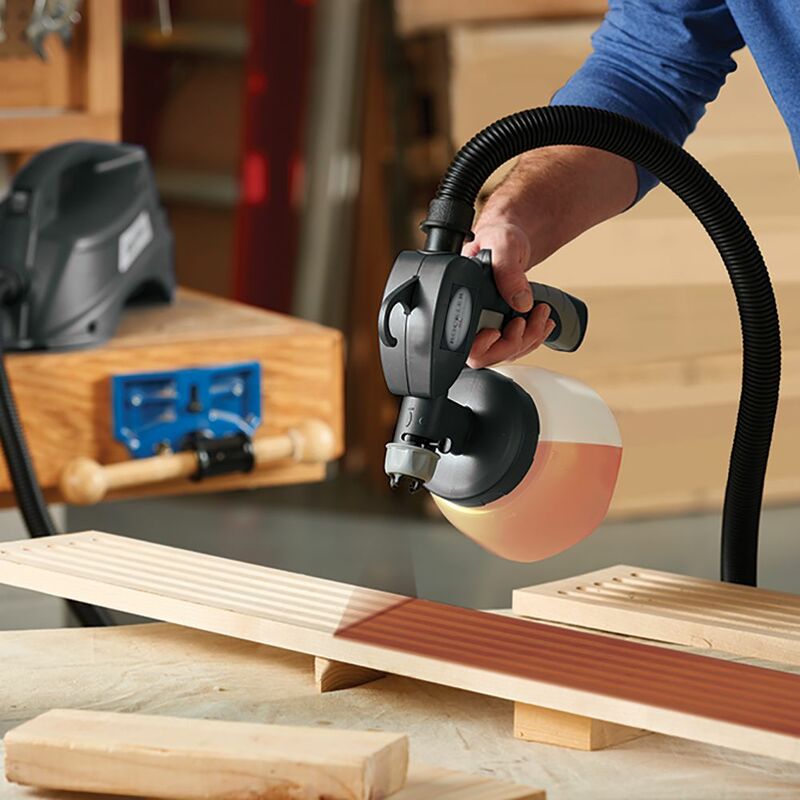 Designed with simplicity and versatility in mind, the Rockler Finishing Sprayer is the ideal solution for anyone wanting a smooth, professional-quality finish in very little time. It is capable of applying anything from lacquer finishes, varnishes and urethanes to unthinned latex paints. Thanks to Earlex® high-volume, low-pressure technology (HVLP), it does so with minimal overspray. The spray pattern is adjustable from 1'' to 12'' wide so you can tailor the output to your needs. 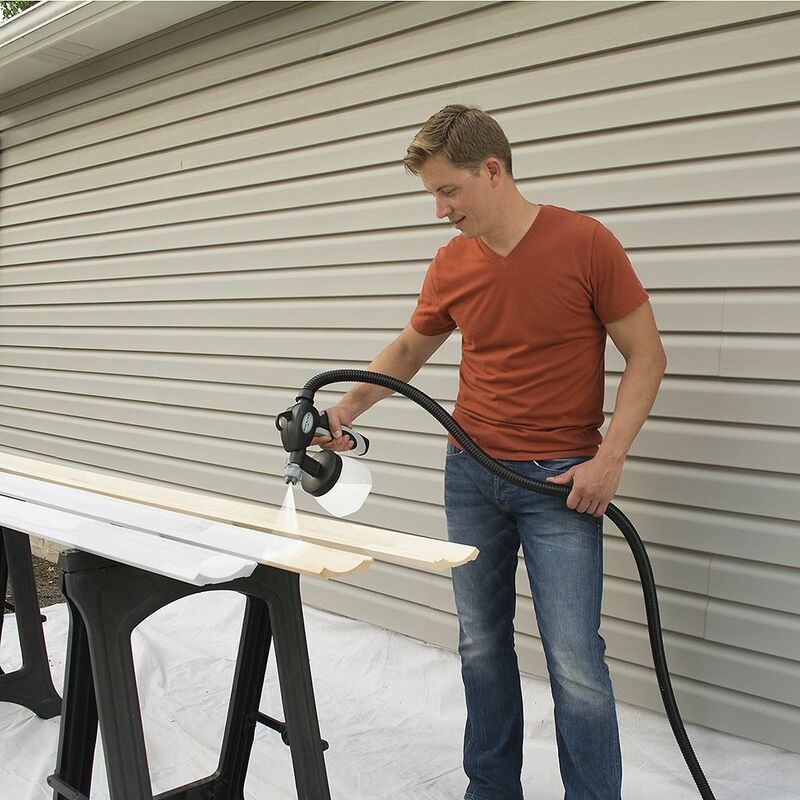 The 13' flexible hose provides enough length so you can move around your project, while the 1 qt. paint cup provides plenty of capacity without excessive weight. 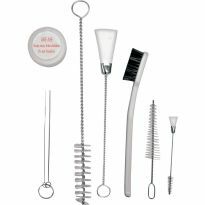 1.5mm and 2.5mm needles are included, along with complete instructions for operation and cleaning. This worth more then I payed for it !!!! Was kind of on the fence about this, But Damm what a job it did. I would say if you have the space to spray and you want to try it Start here. For the price I think it might take years to out grow the sprayer. Now I put 6 coats of water base poly and followed their instruction I did get put a couple of heavy spots that I have to sand and polish but I think A+++ on this sprayer !!! Excellent tool at a great price. This HVLP gun is awesome. So easy to use and cleanup is a breeze! Couldn’t be happier. Outstanding! Painted newly built cabinets with it, after the other sprayer (name starts with "W") disaster. Pro: metal spray nozzles, easy to clean, no awkward motor in my hand. Worked very well. Simple to operate and clean vs large commercial sprayer that we recently rented. 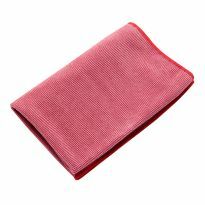 Economical, easy to use and easy to clean. Very compact. I’ve had I this sprayer for a couple of years and use it primarily for shooting clear poly. 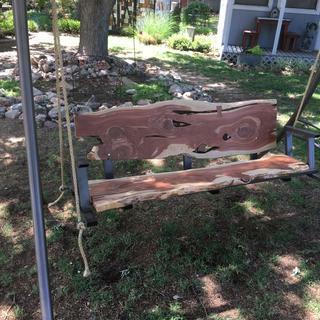 I love it so much that I recently purchased one for my son who is also a woodworker. It works very good for the price. Used to spray cabinets and trim. Great product. I use for all of my spraying applications. Works as advertised. I spray once every two weeks or so, do I didn't need to sound a fortune on a turbine hvlp unit. This unit fills my needs perfectly. I like the fact that Rockler uses Earlex technology in this sprayer. Only had a chance to use it with latex water based primer and it has worked well with 2.5 needle...hose does get warm after using it a while... No splatter,...easy to clean. Very pleased with this sprayer. Works as advertised. Would recommend this product for the novice or professional. i just got this hvlp rockler sprayer the day i finished building a large storage cabinet. It worked so good i couldn't believe it. I sprayed the outside 1color and the in side another. Taking it apart and cleaning it was so simple and fast. Just great! i reccomend to anyone. Used this sprayer for the first time today. After testing on a scrap piece of plywood to get volume corect. I sprayed my cabnit went on nicely very empressed. Over all the years I've been told to never use a sprayer for the final finish. Air bubbles, eleven coats, etc. Boy was I sold a bogus bill of goods. Had a small project that would have been a pain to brush the urethane on to, so I thought I would try a sprayer.. What a breeze! There were no flaws in the first coat (the sanding coat), so I felt kinda dumb going over it with the 220, but I did it anyway. The final 4 coats went down so easily and flat, I couldn't believe it, without any other work. Had many hvlp sprayers and this one by far is the best. Great for paint. Smooth even finish. Would recommend to any woodworker. Great sprayer for the money. Easy to use... great results... WIN! As a DIY'er I've used large HVLP systems to paint a house (fun!) but until recently had been hand-finishing other projects. Bought this unit specifically to work on cabinet's, trim, doors, etc. around the house.. and with few exceptions was very pleased. Only issue was keeping the gun clean between coats, and that's not really something anyone can prevent. Works as the reviews have said. Spraying water based poly and have no complaints. Looks like factory spray. I'll admit it, I was a virgin to HVLP painting when I bought this unit last month to use in spraying kitchen cabinets. It seemed like I would get better (smoother) results spraying than brushing, but I was still anxious to try this approach. OMG...this is so easy to set up, use, dial in, and clean up. The results I received spraying primer followed by two coats of 5% diluted Benjamin Moore Advance in semi-gloss were spectacular. I had no issues with equipment, no splattering, no nozzle clogging, no drips.....no nothing other than a great result. If you are a rookie like me, don't hesitate to buy this equipment. Got to use my new sprayer for the first time today and I am really impressed at the ease of use and quality of finish. It set up quick and was a breeze to use and the results are really impressive. I don't think you can get a better sprayer considering the price. I purchased the sprayer because I wanted to make finishing my projects just a little easier. I really wasn’t expecting a professional finish particularly when using latex paint. I used it for the first time and was amazed at the results. The sprayer performed flawlessly and the end result was simply mind blowing. I have yet to try it with anything other than latex paint, but have no doubt about I will get anything other than professional results! I am a mom..who has never used a sprayer, ever. I tackled the biggest, most fearful project..the kitchen cabinets..I read the reviews and watched a video..after much and proper prep, I just pulled this little machine out and turn it on..and WOWWIE..beautiful spray and soooo easy..It's a sprayer for dummies..I used General Finish Milk paint and then sprayed GF High Performance Satin Poly on..I then scored a free oak table from a neighbor..that's my next project..i'm addicted.. Very impressed with the overall performance of this sprayer. I am recommending this product to all of my friends. Upon receiving the unit I was disappointed that there wasn't a viscosity test cup or dilution recommentions included. However, after watching several YouTube videos on the subject I tried what looked like the most reasonable solution. I have many hours of painting with a high pressure sprayer. This is my first time with a HVLP system. The first project was the interior my son's 2 car garage. 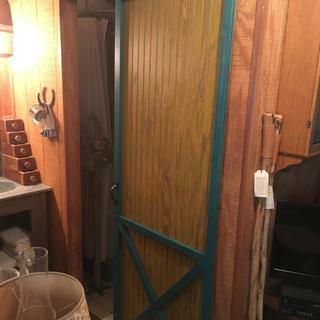 Being a garage we chose cheap ($10.00 a gallon) latex paint. My dilution formula went like this: add 10% water and 16 ounces of flotrol to one gallon of paint. This proved to be perfect. I'm going to reduce the amount of flotrol in the future and see if I get the same results. It only took about 10 passes of the gun to dial in the right amount of paint. After several hours of prepping the walls and ceiling the painting took about 5 hours. With the 1 quart cup there was a lot of stopping to reload the paint. I wonder if it would be possible to have an accessory that could hold a gallon of paint on the floor with a 15' paint hose? Overall, for the money, you just can't beat this HPLV sprayer. Have only tested it by spraying stain/sealer on a cedar fence gate. Adjustments to volume and spray pattern were easy. Clean-up was a breeze. Have not tried heavier latex paints with the 2.0mm needle or small, lightweight spray projects using the separately-purchased 1.0mm needle but expect good results from them, too. Had to repaint a staircase (baseboard, spindles, railings). Spent a significant time carefully masking non-painted staircase hardware, walls, and carpeting to ensure protection from overspray. Attempt #1: Used HF HVLP (former) Rockler clone unit with Sherwin-Williams ProClassic Latex Semi-Gloss Enamel paint. NOT ENOUGH POWER (and the unit's largest needle was 1.8mm). Too much "orange peel" so I didn't even attempt to use the sprayer on my project. Attempt #2: Went to Sherwin-Williams and told them of my efforts with the HF HVLP system. Was informed that only a high-end 5 or 6-stage HVLP system would be viable (for an HVLP). The store manager convinced me to try a hand-held Airless sprayer from Graco. Went home and tried it in the garage on cardboard. Paint seemed to spray nicely, though I had to operate the pressure at the 10-level. Had all my staircase set for spray - masking paper, tape, paint tarp on carpet, and visqueen (taped to ceiling to catch overspray). I positioned about one foot behind vertical 1-in spindles and started to spray. By the fourth spindle, the overspray paint and air pressure caused the visqueen to fail and I had paint all over my leather couch and hardwood floor. After a considerable angry outburst, my wife and I spent the next three hours cleaning up from my 20 seconds of painting. Attempt #3 (AND FINAL ATTEMPT): Having looked online to see if I should "pony-up" for a top-end HVLP system (or just give up and use a roller and brush), I stopped by the Tukwila Rockler location and shared my tale of angst. The very patient Rockler salesman suggested that I try the entry-level Rockler unit. Promising me a full refund, if it didn't work out. With much trepidation, I set up the unit in the garage to test it on cardboard. With the 2.5mm tip installed, I dialed up the pressure and the paint came out at a decent spread rate. While it had some "orange peel" to it, the spray consistency was acceptable, only requiring a small bit of follow-up with a foam brush. I set up in the staircase and within 30 minutes, had successfully laid a extremely decent coat. I followed up with a second (and final) coat about 2 hours later. COULDN'T BE HAPPIER!!!! For those who want to use an HVLP on their home trim/doors, please consider using this system before going out and investing in a high-end unit. If you are careful in masking off your work, clean up should be "reasonable." The unit does throw off fine overspray, but I did NOT get any spatter in unanticipated areas. A quick dusting of shelves and table-tops, followed by thorough vacuuming and all was well! I gave this to my oldest son who is an experienced woodworker , he made this toy box for a friends daughter, the white latex was sprayed with the 2.5 tip and the dark lid polyurethane was sprayed with the 1.5 tip, finished product was beautiful. wished I had this a year ago. For the novice, it works great. Would recommend this for every one that wants a nice finish. I clear coated a knotty pine back splash in the kitchen. looks great and professional. First project - Sprayer worked fine, I'm still learning the paint volume control for stain and arm movement to apply the paint correctly. Overall the deck project turned out pretty good and I'm ready to tackle the shed. I'm no expert but I'm getting better at using the sprayer. Equipment clean-up is quick and easy. I was hesitant on purchasing this unit but I did and I love it. It was very easy to set up and I used it to spray water based polyurethane. It sprayed awesome and had very little overspray. 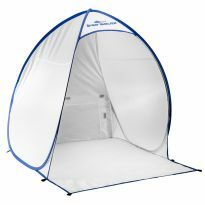 I was going to build me a permanent spray booth but now I have decided that I do not need it. I hope they come out with extra bottles and lids to close them up for the night. I wanted to learn how to use a sprayer before committing to a large dollar outlay. I needed to put a Zinser Water Based Primer on a large shop assembly table-cabinet I am building. 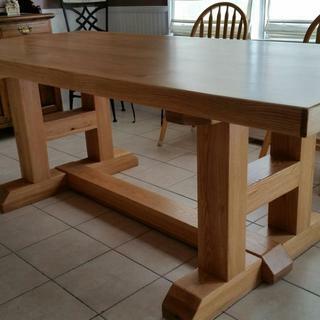 See Stumpy Nubs Assembly Table. I used the primer, added 12% water and a few squirts of extender. Set the sprayer up with the 2.5 ml needle. At first, it was rough with some orange peel. I started to feather the trigger and eventually got to a smooth regular finish and made real progress on the application. Can't wait to try my ultra rite white paint to see final results. Finishing is my absolutely least favorite part of a project. Tried my new Rockler HVLP sprayer for the first time today. Wow. Like night and day. This is one of those tools where you slap your head and wonder why it took so long to buy one. Works great, but like all sprayers, a chore to clean. The blower hose could be a bit more flexible. Still trying to get the hang of adjusting the spray volume properly, but that will come. You need to practice with latex if you’re doing furniture or trim/doors and looking for a smooth glossy finish. I did trim and a book case with Sherwin Williams Pro Classic Acrylic. Thick stuff but tough once cured. 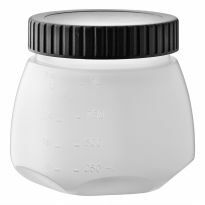 Get a viscosity cup and experiment, especially on a vertical surface. Once you get it dialed in it’s great. Easy to use and clean. 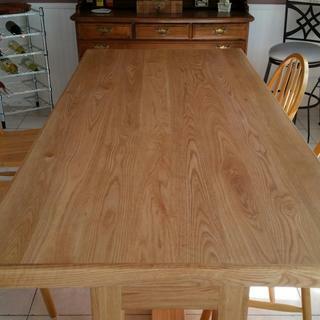 Provided a very good finish with latex paint thinned about 10 %. This was the first and only time I have used the sprayer, but if it sprayed latex easily I don’t think I will have any problems with thinner finishes. Bought this sprayer to finish furniture and reduce the overspray we get from the big sprayer. Works perfectly. Actually painted a bedroom with it. The only improvement I might suggest is some sort of positive locking on the hose at the gun and the compressor end. It pulls our very easily. A twist lock maybe? Used the sprayer on my first job to apply a poly finish to a cabinet. Worked great using the small needle that came with the sprayer. Good range of flow control for the material and the size of the spray pattern emitted from the nozzle. No more brush strokes on my finished product. Second job was using a thicker paint to finish a very large stand. Followed the instructions on the paint can to cut the viscosity of the paint for sprayer application. The large needle was used for this job. Was very please with the range and control provided with this thicker material. It would have taken me a couple of hours to paint this stand, I painted in about 15 minutes. Clean up was simple and easy using the tools that come with the sprayer. A feature I do not like about this sprayer is the air hose connection. The connections are press fit and you really have to push them in hard for them not to pop out as you move around the job with the sprayer. A simple twist lock connections would be an improvement. As to the noise of the motor, it is loud but not excessive. A word about straining your material. I highly recommend that you strain all the material that you intend to use in this sprayer. I made up a homemade strainer using 200 mesh wire for the paint. For the poly material, I rigged up strainer using a discarded Keurig coffee pod on the end of a large funnel. Don't know the mesh size but it worked great for the poly type material. Each nozzle head comes with small "O" ring and I found that applying a small amount of silicon grease made it much easier to remove the heads for cleaning. Would have given it a 5 star rating but the hose connections need to be improved. Written by a woodworker that hates to paint. I had an older model Rockler sprayer where the handguns eventually weren't spraying like they should. I bought a Wagner, but the overspray of the unit was too much! I returned it and went back to Rockler. I bought the new sprayer and have been very pleased with it. The fact that I don't have to thin my paints quite as much is really nice. The turbine is smaller so it is easier to store. Easier to clean, fewer parts to have to scrub. The only thing I don't like is the quality of the plastic used. The hose is very stiff and when I put the it in the turbine, the turbine separates a bit. Makes me wonder about it's durability, but for the price, it is a great sprayer. Yes it’s plastic, including the gun and trigger, and the only metal seems to be the included needles; but, for a hobbyist or weekend woodworker this is a great sprayer for the price. As long as you keep it clean between uses you shouldn’t have any problems. I’ve used it on furniture, small projects (boxes, key holders, etc) and several hundred feet of baseboard and I’m very pleased with the coverage and overall results. First off, I bought this to spray water-based lacquer because I needed a gun with only plastic or stainless steel, and could not really swing the $800 plus Graco Hvlp I was looking at. I have not sprayed anything else through it yet, but this gun was a welcome surprise. It sprays very well, provided you pay attention and realize that the air is constantly spraying through the gun- the trigger only adjusts the fluid. A very important caveat, which is in response to all the negative reviews I read here prior to my purchase: keep the gun clean! Like all sprayers, it works best when it is well-maintained. I break it down at the end of every day and clean the fluid path to like-new condition, and clean the tip if I take a beak for lunch to keep dried product from building up on the needle and nozzle tip. Buy the extra cup and lid! Turbine powered HVLP is the only sensible alternative to spraying projects when potential overspray is a concern. Using a compressed air HVLP gun will do the job too, but you will have significant overspray since the pressure is nearly 10x the amount that a typical turbine powered HVLP produces. This unit can produce a very good finish. It is easy to use, consists of a few simple parts so there is not much that can go wrong. If want a very good finish, your budget is limited, and you are okay with using a plastic gun, this the unit for you. A great feature about this unit, is that the turbine provides more than enough power for the Earlex 5500 professional gun; if you see the need for a professional gun in the future, you can add that without buying an entirely new system. Filled it with latex, turned it on and painted a deck and doors with little to no adjustment needed. I had never painted with a sprayer before -- this was almost too easy. Only negative: I did have to clean paint buildup on the spray nozzle but may be part my fault for not adjusting for over an hour of almost continuous operation. Can't wait to try some urethane finish. This sprayer produces a very nice finish. Surprisingly good sprayer for the money. Ive been using it to spray lacquer on newly built kitchen cabinets. My one complaint would be that the plastic tool for removing the needle broke the third time I used it. Used it a couple days ago for first time. sprayed a large toy chest wth poly. four coats and it came out beautiful. would recommend it for this kind of projects. I choose this sprayer because #1 it was on sale, and #2 all the great reviews. So I guess I'll find out if it was worth it or not. Recommended by a friend who has used this type of sprayer. Price and I was ready to finish some cabinets. Low cost, thought I would give it a try. The cost and other reviews saying how easy it was to use and the quality of finish that the machine laid down. Portability and quality associated with the product. To try spray finishing without a large investment (I can always upgrade later if I find I need a higher end model) and spray my porch railings. I saw it advertised and have a project underway that I would like to have a spray finish applied too. The price seemed reasonable and than I see it on sale so I decided to try it out. Have used one and at this price, another is a good back-up. Updating and expanding my capabilities. 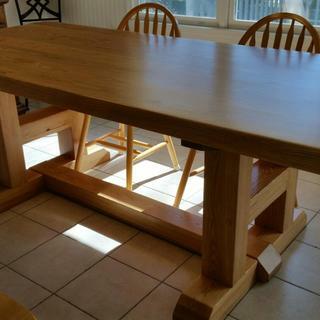 Looking for a great sprayer to use on the furniture I make for the family. Saw an article in Home Handyman. In the process of building kitchen cabinets and from the reviews this should apply the desired finish on the cabinets. I'm a carpenter making cabinets and prices of furniture for a customer and they want a spay finish. Instead of sending them a finishing shop I would do them my self. SALE! Can’t wait to try this out on so many projects! 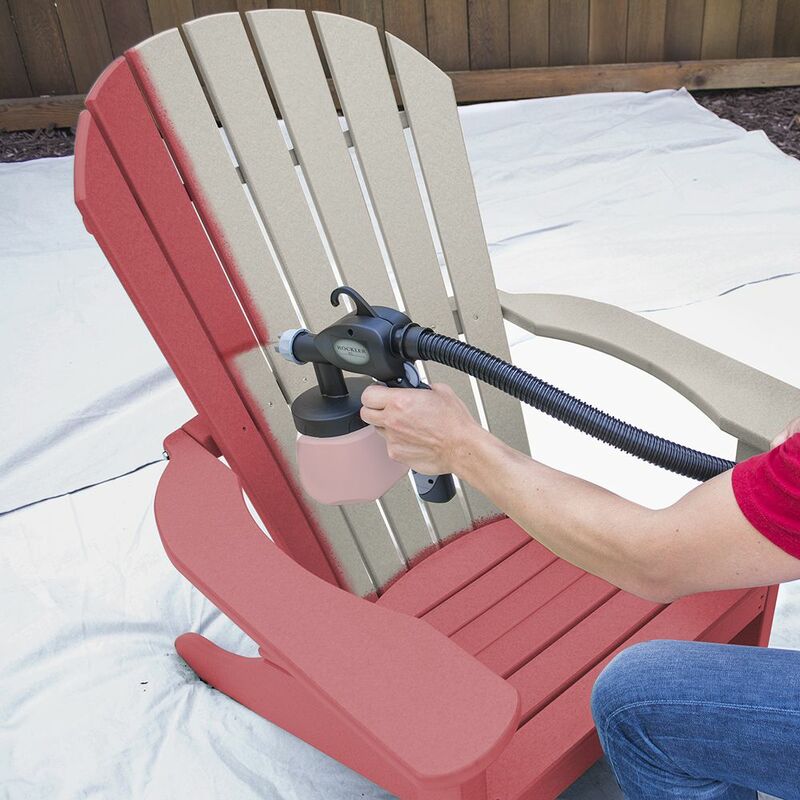 Price and the rocker brand name.. Good reviews ..
To spray urethane on outdoor furniture build coming up. Looks perfect for my cabinet and small project work based on the reviews. I seen a review on this HVLP on YouTube and it was highly recommended. I have another HVLP sprayer that is ok......but I am in search of an economically priced sprayer that will give me better results. So after reading the reviews I decided to try this one since it is on sale this month. Good reviews and features for the price. The reviews seem to be positive and it says it can spray most products. Which tip is best for spraying poleurathane? BEST ANSWER: The fine finish needle is the 1.5mm, it should give you better atomization, the 2.5 will also spray urethane, but a much thicker application too. As a cabinetmaker I use the 1.5 for my fine finishing, no matter what the material I am spraying. I used the 2.5 on about medium to low spray and it worked great. I just cleaned the nozzle ever so often. The results were beautiful. will this spray epoxy paint? BEST ANSWER: It sure will, we sell a lot of these to tub refinishers. Clean the gun out quickly when you're done. Will it spray latex without thinning? BEST ANSWER: It will spray any liquid up to and including the viscosity of latex paints and epoxies. Yes, it is capable of applying anything from lacquer finishes, varnishes and urethanes to unthinned latex paints. BEST ANSWER: Easy. Use the 1.5mm needle. 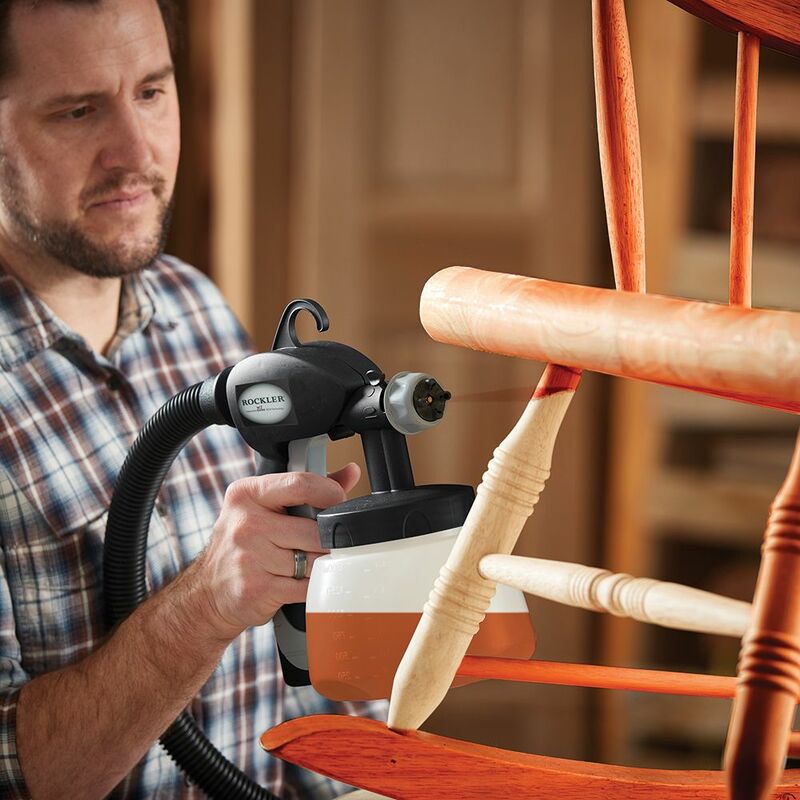 About ease of cleanup for the Rockler HVLP Finishing Sprayer? BEST ANSWER: Easy. Take it apart, wash the parts, put it together. Very simple process to follow. I think it takes less time than cleaning brushes and/or rollers. Hands still get wet unless you wear gloves. why would I need a 1.0 mm needle for the rockler finishing sprayer? BEST ANSWER: The smaller opening gives an ultra-fine finish when spraying thin materials, such as lacquers, urethanes and varnishes. For normal furniture finishing you want to finish in about 3-4 coats. That's perfect for using the 1.5mm needle. But if you're doing a grand piano and you want to apply 30 very thin coats of lacquer, use the 1.0mm needle for that. Does enamle paint require thinning prior to spraying? Do you need a special lacquer with this sprayer? Most I've seen say for brushing only. 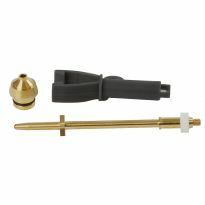 Has anyone used the Earlex 5500 professional gun with this instead of the plastic one that comes with it? What is it's decibel rating, noise level? BEST ANSWER: Not sure of the dB raiting but it wasn't too loud. I sprayed trim in a small bathroom and didn't wear ear protection. It reminds me of my Kenmore vacuum (probably a little louder). 69dB. Less noisy than your router. Is there a constant flow of air through the spray tip or does the air flow start and stop with the pull of the trigger? There is constant air flow. Do I need an air compressor, or is this all I require? These are true HVLP systems that have a turbine included. Plug and play. the hvlp I purchased just recently, does it have a viscosity rating for shooting paints, oil and latex? can this sprayer spray water based stains and oil based stains? BEST ANSWER: Water based, oil based and lacquer based too! 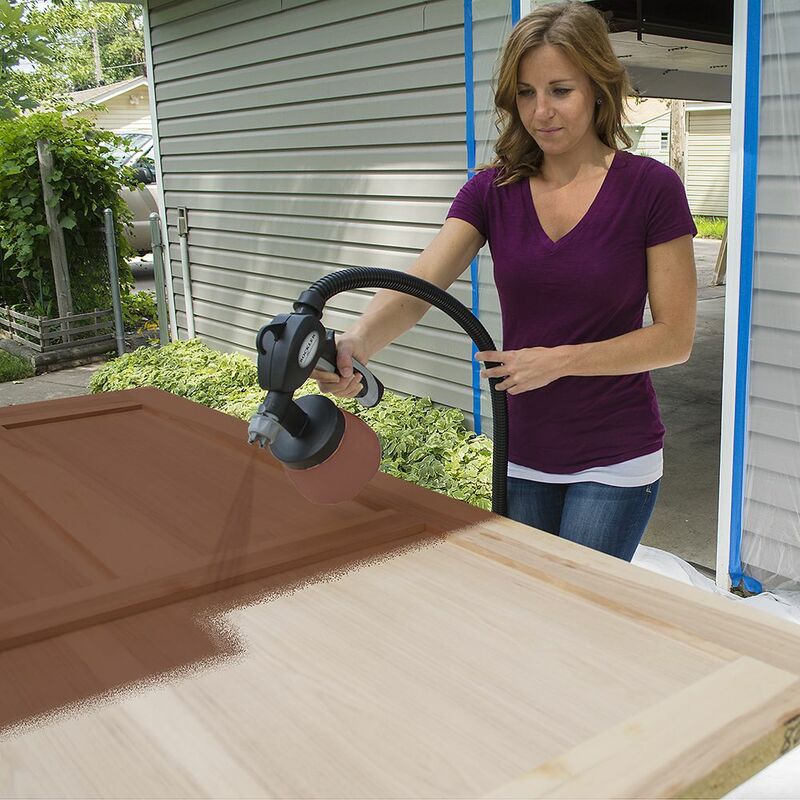 I'm looking to spray my poplar doors and drawer fronts so I just recently purchased a Wagner 518080 HVLP sprayer to spray them. I have thinned the Zinsser primer (haven't gotten to paint yet) to what the manufacture recommends (10 oz water per gallon), but yet I cannot get this sprayer to spray right/smoot finish. My question is this, is this made by Wagner (read that it uses wagner filters) or Rockler? 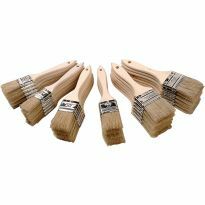 Can I use this with on poplar to get a smooth finish if I use the 1.5mm and Sherwin Williams Pro paint? How do i use it for ceilings? BEST ANSWER: You sure can spray ceilings, just turn the pickup tube around so it points towards the back of the cup and start spraying. I don't know if you would really want to but the pickup tube is rotatable. The angled intake would point backwards in the jar so when the gun is tipped upwards paint would still be picked up. Why does hose get hot during spraying?? BEST ANSWER: The longer the motor runs, the more friction generated heat there is. It will top out at about 109F. It has no effect on the system or finishing. I can always experiment, but if someone already knows, ask. What laytex paint brand and thinning ratio works to refinish furniture in 3-4 coats (first being a primer)? BEST ANSWER: I've had my sprayer for just a short time so I am still experimenting. But I use Behr and add a small amount of Flotrol. 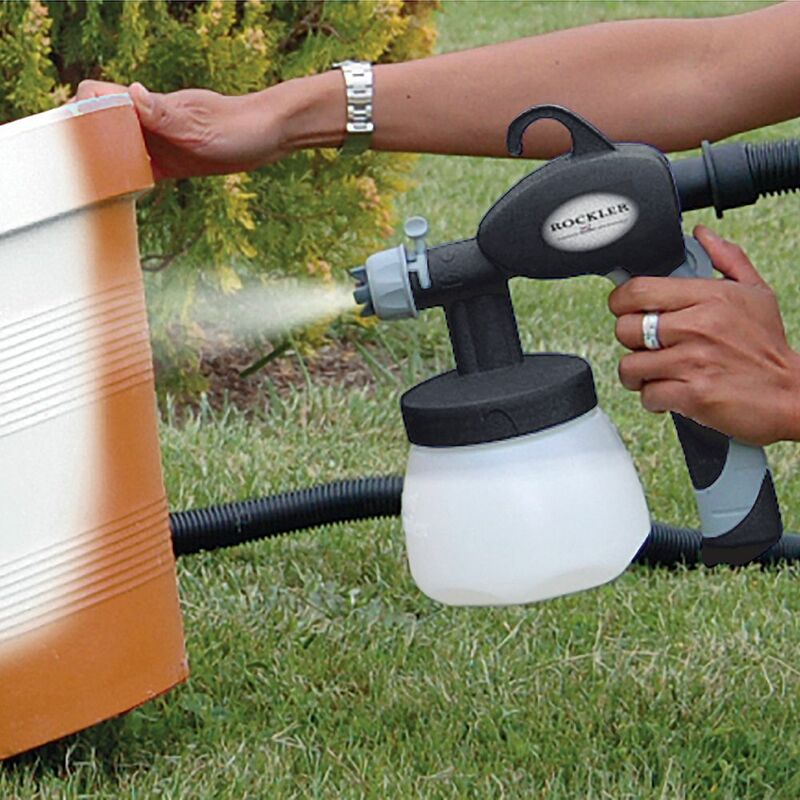 This sprayer does not require a whole lot of thinning for the paint. 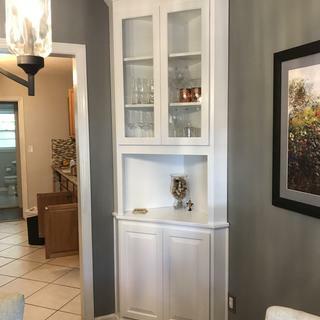 I painted MDF cabinet doors and did not prime and I got a really smooth finish (Behr paint w/primer). Where can I find a 2.5mm replacement needle? Gravity feed seems to be more versatile than siphon guns. 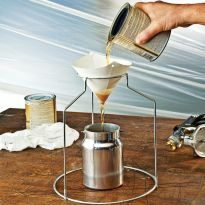 Will this system be available with a gravity feed gun or will it even work with a gravity fed paint gun? I have never had a sprayer before, but I have seen where professional painter use them and overspray or air borne particles end up everywhere. I have a small shop (but I imagine no matter how big they all seem small from time to time) and I can't dedicate a space for spraying. Which leads to my question, how much overspray is there with this sprayer? Will I have to cover all my big tools? I can clear a space put down drop clothes, etc. but even with spray cans in my shop it seems that it gets air borne and goes everywhere. BEST ANSWER: A conventional air compressor set up gives you about 40% over spray, with HVLP it's below 10% and gets better as you get better with the sprayer. You should always have some ventilation and expect some overspray. Common sense stuff, like get your wife's car out of the room, cover tools and washing machine and the next project in progress that you don't want to paint white. Good luck with your projects. I've only used the sprayer once so far but overspray wasn't a problem for me. I also have a small shop. I did take the precaution of a drop cloth and I covered my workbench just to be sure. 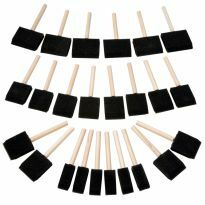 Do you recommend the extra dollars for the cleaning kit or easy enough to clean without? BEST ANSWER: I found that a small cleaning brush came with my unit. The unit is so easy to disassemble and clean that I do not plan to spend the money on the cleaning kit. I previously purchased the inexpensive Rockler HVLP-1000. It did not work with unthinned latex, and does not work very well even after significant thinning to get the required viscosity. The spray tended to splatter somewhat, which can be a nice texture, but hard to reproduce. Does the newer Finish Sprayer really work better with unthinned latex? Is there some reason this model will perform better? Should it possible to get a smooth finish, or will it likely be dimpled without thinning or using Floetrol? BEST ANSWER: There is a huge difference in power. The old version was getting about 1.5psi the new Rockler Finish Sprayer gives you 3.5psi which will spray un-thinned latex paint. Use the larger needle for spraying un-thinned latex on a wall with a slight roller like texture, to eliminate that texture thin about 5% with water. 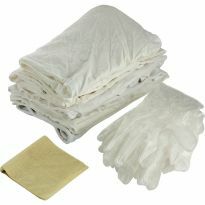 Use the small needle for "fine" finishing, even with latex, but thin it 10% with water and add Floetrol to help it level. If you're looking for a "mirror" finish, you won't find it with latex paint. 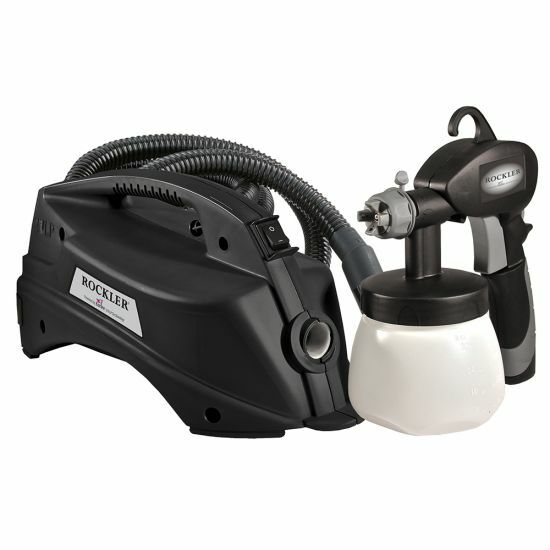 Rockler has lots of finishing products that will give you a mirror finish while using this sprayer. I just used the new sprayer I got from Rockler, and was very happy. I sprayed latex paint out of the can with a little thinner with water. It was pretty thick, but yet sprayed fine. I played with the volume dial some to get more material to spray, but generally I was very happy with the results. For the money, I don't think you can wrong with this product. Thanks for the response. For my goals I think spraying latex with HVLP sprayers is not the answer. For other goals, such as walls or smaller exterior surfaces, it might be fine where a thick layer is OK, but it won't work well if the goal is to get a very smooth finish for furniture or small projects. That is not a criticism of the sprayer, just the reality of using HVLP to spray latex. Does this cup fit the Rockler HVLP Finishing Sprayer Item #: 56405? BEST ANSWER: Unfortunately the old replacement cups do no fit on the new unit. We are expecting to get replacement cups for the new sprayer in the fall. Sorry the old system and the new one do not have any interchangeable parts. In the description it mentions that you do not have to thin latex paint. Yet when I read the on-line instruction booklet, it said latex had to be thinned. What's the correct answer? Using the 2.5mm needle set you can spray un-thinned latex paint. You will get a roller like texture when you do that. To eliminate the texture, thin about 5% with water. For a "fine" finish with latex paint, use the 1.5mm needle and thin the paint about 10% with water and add Floetrol also. Do it spray oil based gloss Rust-Oleum and 2k clear coat acrylic urethane?? BEST ANSWER: Not sure, I only use it on poly and it works very well. Hope this helps. Can I keep paint in the sprayer in between coats? Yes. I had no problem with latex paint and up to 2+ hours. 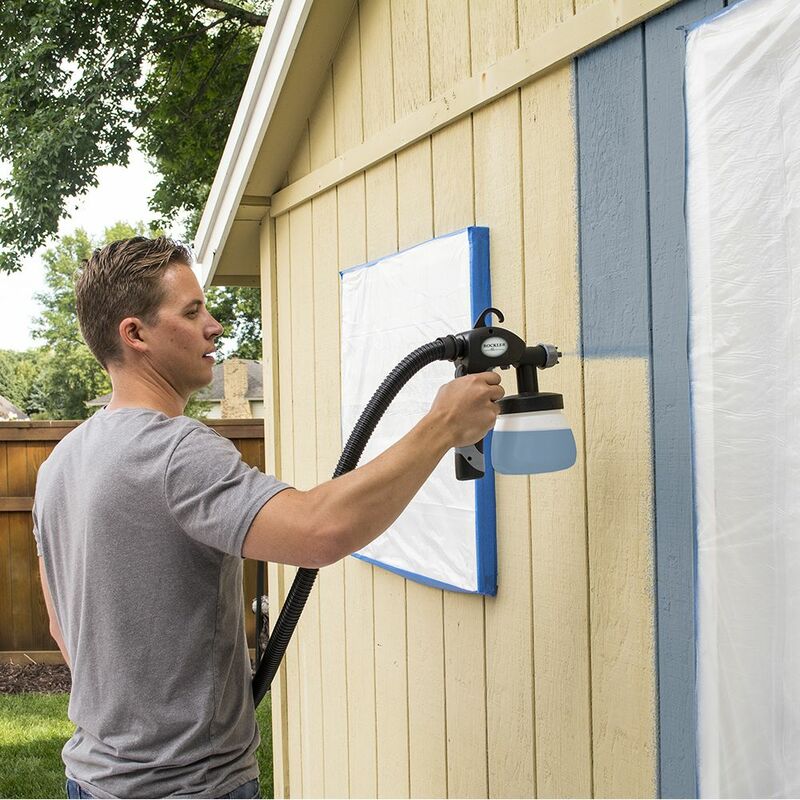 The only tip is to wipe off the spray tip as there is usually a slight buildup of paint that will dry. It is an excellent sprayer. A great buy. Yes, I have not had any problems doing it. What angle will the sprayer work at? BEST ANSWER: The pickup tube in the paint canister can be positioned at any angle, front, back, sides, so it will pick up paint at basically any angle. The degree of angle will dictate how much paint you will be able to draw up which will determine how often you need to refill the paint canister. I painted both overhead and straight down on a floor, the sprayer worked fine and I was able to draw almost all of the paint from the paint canister. Extreme angles didn't seem to cause any sprayer malfunctions. You can also vary the spay pattern from vertical to horizontal to spot which helps if you have to angle the sprayer. I used this sprayer painting shelves on a table with acrylic paint. I sprayed facing straight down to about a 45 degree angle. The sprayer worked flawless. I highly recommend this unit. Just about any angle but upside down. I recently installed a pine T&G wood ceiling at my cabin and now want to finish it with Varathane. Can I use this sprayer to spray the overhead ceiling and how much overspray is there? BEST ANSWER: This is the best easiest to use sprayer I have found. No need to adjust air and material volume. There is very little overspray. Very easy to clean. You can spray overhead by turning the siphon tube to point backwards. I highly recommend this unit. Amazing price but it's all plastic so it will be interesting to see how it holds up.